An anaerobic organism or anaerobe is any organism that does not require oxygen for growth. It may react negatively or even die if free oxygen is present. (In contrast, an aerobic organism (aerobe) is an organism that requires an oxygenated environment. Anaerobes may be unicellular (e.g. protozoans, bacteria) or multicellular. Spinoloricus nov. sp., a metazoan that metabolises with hydrogen, lacking mitochondria and instead using hydrogenosomes. In his letter of 14 June 1680 to The Royal Society, Antonie van Leeuwenhoek described an experiment he carried out by filling two identical glass tubes about halfway with crushed pepper powder, to which some clean rain water was added. Van Leeuwenhoek sealed one of the glass tubes by using a flame and left the other glass tube open. Several days later, he discovered in the open glass tube ‘a great many very little animalcules, of divers sort having its own particular motion.’ Not expecting to see any life in the sealed glass tube, Van Leeuwenhoek saw to his surprise ‘a kind of living animalcules that were round and bigger than the biggest sort that I have said were in the other water.’ The conditions in the sealed tube had become quite anaerobic owing to consumption of oxygen by aerobic microorganisms. 1: Obligate aerobes need oxygen because they cannot ferment or respire anaerobically. They gather at the top of the tube where the oxygen concentration is highest. 2: Obligate anaerobes are poisoned by oxygen, so they gather at the bottom of the tube where the oxygen concentration is lowest. 3: Facultative anaerobes can grow with or without oxygen because they can metabolise energy aerobically or anaerobically. They gather mostly at the top because aerobic respiration generates more adenosine triphosphate (ATP) than either fermentation or anaerobic respiration. 4: Microaerophiles need oxygen because they cannot ferment or respire anaerobically. However, they are poisoned by high concentrations of oxygen. 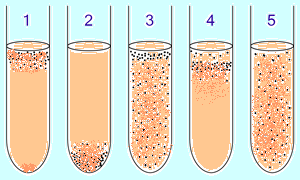 They gather in the upper part of the test tube but not the very top. 5: Aerotolerant organisms do not require oxygen as they metabolise energy anaerobically. Unlike obligate anaerobes however, they are not poisoned by oxygen. They can be found evenly spread throughout the test tube. Obligate anaerobes, which are harmed by the presence of oxygen. Two examples of obligate anaerobes are Clostridium botulinum and the bacteria which live near hydrothermal vents on the deep-sea ocean floor. Aerotolerant organisms, which cannot use oxygen for growth, but tolerate its presence. Facultative anaerobes, which can grow without oxygen but use oxygen if it is present. Some obligate anaerobes use fermentation, while others use anaerobic respiration. Aerotolerant organisms are strictly fermentative. In the presence of oxygen, facultative anaerobes use aerobic respiration; without oxygen, some of them ferment; some use anaerobic respiration. There are many anaerobic fermentative reactions. The energy released in this equation is approximately 150 kJ per mol, which is conserved in regenerating two ATP from ADP per glucose. This is only 5% of the energy per sugar molecule that the typical aerobic reaction generates. The energy released is about 180 kJ per mol, which is conserved in regenerating two ATP from ADP per glucose. Anaerobic bacteria and archaea use these and many other fermentative pathways, e.g., propionic acid fermentation, butyric acid fermentation, solvent fermentation, mixed acid fermentation, butanediol fermentation, Stickland fermentation, acetogenesis, or methanogenesis. Since normal microbial culturing occurs in atmospheric air, which is an aerobic environment, the culturing of anaerobes poses a problem. Therefore, a number of techniques are employed by microbiologists when culturing anaerobic organisms, for example, handling the bacteria in a glovebox filled with nitrogen or the use of other specially sealed containers, or techniques such as injection of the bacteria into a dicot plant, which is an environment with limited oxygen. The GasPak System is an isolated container that achieves an anaerobic environment by the reaction of water with sodium borohydride and sodium bicarbonate tablets to produce hydrogen gas and carbon dioxide. Hydrogen then reacts with oxygen gas on a palladium catalyst to produce more water, thereby removing oxygen gas. The issue with the Gaspak method is that an adverse reaction can take place where the bacteria may die, which is why a thioglycollate medium should be used. The thioglycollate supplies a medium mimicking that of a dicot, thus providing not only an anaerobic environment but all the nutrients needed for the bacteria to thrive. Except for three species of anaerobic loricifera, all known complex multicellular life is aerobic, i.e. needs oxygen to survive. In 2010 three species of anaerobic loricifera were discovered in the hypersaline anoxic L'Atalante basin at the bottom of the Mediterranean Sea. They lack mitochondria which contain the oxidative phosphorylation pathway, which in all other animals combines oxygen with glucose to produce metabolic energy, and thus they consume no oxygen. Instead these loricifera derive their energy from hydrogen using hydrogenosomes. Some organisms metabolise primarily using glycogen, for example the Nereid (worm)s and some polychaetes, or the juvenile form of the pork parasite Trichinella spiralis which causes trichinosis. ^ Upcroft P, Upcroft JA (January 2001). "Drug Targets and Mechanisms of Resistance in". Clin. Microbiol. Rev. 14 (1): 150–164. doi:10.1128/CMR.14.1.150-164.2001. PMC 88967. PMID 11148007. ^ Levinson, W. (2010). Review of Medical Microbiology and Immunology (11th ed.). McGraw-Hill. pp. 91–93. ISBN 978-0-07-174268-9. ^ a b Danovaro R; Dell'anno A; Pusceddu A; Gambi C; et al. (April 2010). "The first metazoa living in permanently anoxic conditions". BMC Biology. 8 (1): 30. doi:10.1186/1741-7007-8-30. PMC 2907586. PMID 20370908. ^ a b Gest, Howard. (2004) The discovery of microorganisms by Robert Hooke and Antoni van Leeuwenhoek, Fellows of the Royal Society, in: 'The Royal Society May 2004 Volume: 58 Issue: 2: pp. 12. ^ Prescott LM, Harley JP, Klein DA (1996). Microbiology (3rd ed.). Wm. C. Brown Publishers. pp. 130–131. ISBN 978-0-697-29390-9. ^ Brooks GF, Carroll KC, Butel JS, Morse SA (2007). Jawetz, Melnick & Adelberg's Medical Microbiology (24th ed.). McGraw Hill. pp. 307–312. ISBN 978-0-07-128735-7. ^ a b c Hogg, S. (2005). Essential Microbiology (1st ed.). Wiley. pp. 99–100. ISBN 978-0-471-49754-7. ^ Pommerville, Jeffrey (2010). Alcamo's Fundamentals of Microbiology. Jones and Bartlett Publishers. p. 177. ISBN 9781449655822. ^ Slonim, Anthony; Pollack, Murray (2006). Pediatric Critical Care Medicine. Lippincott Williams & Wilkins. p. 130. ISBN 9780781794695. ^ "GasPak System" Archived 2009-09-28 at the Wayback Machine. Accessed May 3, 2008. ^ Schöttler, U. (November 30, 1979). "On the Anaerobic Metabolism of Three Species of Nereis (Annelida)" (PDF). Marine Ecology Progress Series. 1: 249–54. doi:10.3354/meps001249. ISSN 1616-1599. Retrieved February 14, 2010. ^ Roberts, Larry S.; John Janovay (2005). Foundations of Parasitology (7th ed.). New York: McGraw-Hill. pp. 405–407. An aerobic organism or aerobe is an organism that can survive and grow in an oxygenated environment. In contrast, an anaerobic organism (anaerobe) is any organism that does not require oxygen for growth. Some anaerobes react negatively or even die if oxygen is present. Amphibacillus xylanus is a gram-positive-spore forming bacterium with cells 0.3 μm to 0.5 μm in diameter and 0.9 μm to 1.9 μm in length. A. xylanus is a facultative anaerobic organism which can grow in several different environments. Its success in a multitude of environments stems from multiple metabolic pathways, each with high ATP yields. It is flagellated and motile. It grows best at pH 8.0-10.0 but not at pH 7.0. It is catalase and oxidase negative. This helps to explain better the unique method of metabolism on which the organism relies. The cells have meso-diaminopimelic acid. The cellular fatty acids consists of iso-branched and anteiso-branched acids and considerable amounts of straight-chain acids. The DNA base composition of these strains ranged from 36 to 38 G+C % (guanine plus cytosine). This in combination with DNA homology determined that A. xylanus was not related to strains of representative species of the genera bacillus, clostridium, and sporolactobacillus. Considering these and its unique metabolism along with 5S rRNA (ribosomal RNA) sequencing the bacterium is hard to relate to other bacteria in its taxonomic schemes as so little of its genome matched any other bacterium. Aspiration pneumonia is a type of lung infection that is due to a relatively large amount of material from the stomach or mouth entering the lungs. Signs and symptoms often include fever and cough of relatively rapid onset. Complications may include lung abscess. Some include chemical pneumonitis as a subtype, which occurs from acidic but non-infectious stomach contents entering the lungs.Infection can be due to a variety of bacteria. Risk factors include decreased level of consciousness, problems with swallowing, alcoholism, tube feeding, and poor oral health. Diagnosis is typically based on the presenting history, symptoms, chest X-ray, and sputum culture. Differentiating from other types of pneumonia may be difficult.Treatment is typically with antibiotics such as clindamycin, meropenem, ampicillin/sulbactam, or moxifloxacin. For those with only chemical pneumonitis, antibiotics are not typically required. Among people hospitalized with pneumonia, about 10% are due to aspiration. It occurs more often in older people, especially those in nursing homes. Both sexes are equally affected. A facultative anaerobe is an organism that makes ATP by aerobic respiration if oxygen is present, but is capable of switching to fermentation if oxygen is absent. Some examples of facultatively anaerobic bacteria are Staphylococcus spp., Streptococcus spp., Escherichia coli, Salmonella, Listeria spp. and Shewanella oneidensis. Certain eukaryotes are also facultative anaerobes, including fungi such as Saccharomyces cerevisiae and many aquatic invertebrates such as Nereid (worm) polychaetes. Gangrene is a type of tissue death caused by a lack of blood supply. Symptoms may include a change in skin color to red or black, numbness, swelling, pain, skin breakdown, and coolness. The feet and hands are most commonly affected. Certain types may present with a fever or sepsis.Risk factors include diabetes, peripheral arterial disease, smoking, major trauma, alcoholism, HIV/AIDS, frostbite, and Raynaud's syndrome. It can be classified as dry gangrene, wet gangrene, gas gangrene, internal gangrene, and necrotizing fasciitis. The diagnosis of gangrene is based on symptoms and supported by tests such as medical imaging.Treatment may involve surgery to remove the dead tissue, antibiotics to treat any infection, and efforts to address the underlying cause. Surgical efforts may include debridement, amputation, or the use of maggot therapy. Efforts to treat the underlying cause may include bypass surgery or angioplasty. In certain cases, hyperbaric oxygen therapy may be useful. How commonly the condition occurs is unknown. Biology is the study of life and its processes. Biologists study all aspects of living things, including all of the many life forms on earth and the processes in them that enable life. These basic processes include the harnessing of energy, the synthesis and duplication of the materials that make up the body, the reproduction of the organism and many other functions. Biology, along with chemistry and physics is one of the major disciplines of natural science. The Jundiz recycling plant is located in the Basque Country (autonomous community), particularly in Vitoria-Gasteiz Jundiz Álava. This place is responsible for recycling the city garbage. The trash is converted by a physical-chemical or mechanical process to submit a substance or a product already used to a cycle of total or partial treatment for a commodity or a new product or raw materials from waste, introducing them back into life cycle. This occurs at the prospect of depletion of natural resources, macro economic and eliminate waste efficiently. Methanosarcina is a genus of euryarchaeote archaea that produce methane. These single-celled organisms are known as anaerobic methanogens that produce methane using all three metabolic pathways for methanogenesis. They live in diverse environments where they can remain safe from the effects of oxygen, whether on the earth's surface, in groundwater, in deep sea vents, and in animal digestive tracts. Methanosarcina grow in colonies. The amino acid pyrrolysine was first discovered in a Methanosarcina species, M. barkeri. Primitive versions of hemoglobin have been found in M. acetivorans, suggesting the microbe or an ancestor of it may have played a crucial role in the evolution of life on Earth. Species of Methanosarcina are also noted for unusually large genomes. M. acetivorans has the largest known genome of any archaeon. According to a theory published in 2014, Methanosarcina may have been largely responsible for the largest extinction event in the Earth's history, the Permian–Triassic extinction event. The theory suggests that acquisition of a new metabolic pathway via gene transfer followed by exponential reproduction allowed the microbe to rapidly consume vast deposits of organic carbon in marine sediments, leading to a sharp buildup of methane and carbon dioxide in the Earth's oceans and atmosphere that killed around 90% of the world's species. This theory could better explain the observed carbon isotope level in period deposits than other theories such as volcanic activity. Methanosarcina has been used in waste water treatment since the mid-1980s. Researchers have sought ways to use it as an alternative power source. Methanosarcina strains were grown in single-cell morphology (Sowers et al. 1993) at 35 °C in HS broth medium containing 125 mM methanol plus 40 mM sodium acetate (HS-MA medium). Propionigenium modestum is a gram-negative, strictly anaerobic organism. It is rod-shaped and around 0.5-0.6 x 0.5-2.0μm in size. It is important in the elucidation of mechanism of ATP synthase. Putrefying bacteria are bacteria involved in putrefaction of living matter. Along with other decomposers, they play a critical role in recycling nitrogen from dead organisms. Serratia marcescens () is a species of rod-shaped, Gram-negative bacteria, that is also a facultative anaerobic organism, classified as an opportunistic pathogen in the family Enterobacteriaceae. It was discovered in 1819 by Bartolomeo Bizio in Padua, Italy. S. marcescens is commonly involved in hospital-acquired infections (HAIs), particularly catheter-associated bacteremia, urinary tract infections, and wound infections, and is responsible for 1.4% of HAI cases in the United States. It is commonly found in the respiratory and urinary tracts of hospitalized adults and in the gastrointestinal systems of children. Due to its abundant presence in the environment, and its preference for damp conditions, S. marcescens is commonly found growing in bathrooms (especially on tile grout, shower corners, toilet water lines, and basins), where it manifests as a pink, pink-orange, or orange discoloration and slimy film feeding off phosphorus-containing materials or fatty substances such as soap and shampoo residue. Once established, complete eradication of the organism is often difficult, but can be accomplished by application of a bleach-based disinfectant. Rinsing and drying surfaces after use can also prevent the establishment of the bacterium by removing its food source and making the environment less hospitable. S. marcescens may also be found in environments such as dirt, supposedly "sterile" places, and the subgingival biofilm of teeth. Due to this, and because S. marcescens produces a reddish-orange tripyrrole pigment called prodigiosin, it may cause staining of the teeth. The biochemical pathway for the production of prodigiosin by S. marcescens has been characterized by analyzing what intermediates becomes accumulated in specific mutants. Shewanella violacea DSS12 (S. violacea) is a gram-negative bacterium located in marine sediment in the Ryukyu Trench at a depth of 5,110m. The first description of this organism was published in 1998 by Japanese microbiologists Yuichi Nogi, Chiaki Kato, and Koki Horikoshi, who named the species after its violet appearance when it is grown on Marine Agar 2216 Plates.Shewanella violacea is a motile rod-shaped bacterium with flagella. It is a facultative anaerobic organism and considered an extremophile due to its optimal growing conditions at 8ᵒC and 30 MPa. Researchers are evaluating this species to better understand the specific mechanisms S. violacea uses in order to thrive in its unusually cold and high-pressure environment. Spinoloricus cinziae is an animal species described in 2014 in the phylum Loricifera.It is the first animal species described that does not require oxygen at any point during its life. The species, along with two other newly discovered species, Rugiloricus nov. sp. and Pliciloricus nov. sp., were found in the sediment of the anoxic L'Atalante basin of the Mediterranean Sea.Electron microscope images show that the species' cellular innards appear to be adapted for a zero-oxygen life. Their mitochondria appear to act as hydrogenosomes, organelles which provide energy in some anaerobic single-celled creatures.With a visual resemblance to tiny cups with tentacles sticking out, the species has been said to look like something out of a Dr. Seuss book.At adulthood, this species is characterized by a mouth cone with eight oral ridges, a neck with eight single trichoscalids alternating with seven double trichoscalids, as well as lorical plates with spikes located at the corners. More than 30 species in this group have been described. Terrestrial analogue sites (also called "space analogues") are places on Earth with assumed past or present geological, environmental or biological conditions of a celestial body such as the Moon or Mars. Analogue sites are used in the frame of space exploration to either study geological or biological processes observed on other planets, or to prepare astronauts for surface extra-vehicular activity. Yersinia pestis (formerly Pasteurella pestis) is a gram-negative, nonmotile, rod-shaped coccobacillus bacteria, with no spores. It is a facultative anaerobic organism that can infect humans via the Oriental rat flea. It causes the disease plague, which takes three main forms: pneumonic, septicemic and bubonic plagues. All three forms were responsible for a number of high-mortality epidemics throughout human history, including: the sixth century's Plague of Justinian; the Black Death, which accounted for the death of at least one-third of the European population between 1347 and 1353; and the Third Pandemic, sometimes referred to as the Modern Plague, which began in the late nineteenth century in China and spread by rats on steamboats claiming close to 10,000,000 lives. These plagues likely originated in China and were transmitted west via trade routes. Recent research indicates that the pathogen may have been the cause of what is described as the Neolithic Decline, when European populations declined significantly. This would push the date to much earlier and might be indicative of an origin in Europe rather than Eurasia. Y. pestis was discovered in 1894 by Alexandre Yersin, a Swiss/French physician and bacteriologist from the Pasteur Institute, during an epidemic of the plague in Hong Kong. Yersin was a member of the Pasteur school of thought. Kitasato Shibasaburō, a German-trained Japanese bacteriologist who practised Koch's methodology, was also engaged at the time in finding the causative agent of the plague. However, Yersin actually linked plague with Y. pestis. Named Pasteurella pestis in the past, the organism was renamed Yersinia pestis in 1944. Every year, thousands of cases of the plague are still reported to the World Health Organization, although with proper treatment, the prognosis for victims is now much better. A five- to six-fold increase in cases occurred in Asia during the time of the Vietnam War, possibly due to the disruption of ecosystems and closer proximity between people and animals. The plague is now commonly found in sub-Saharan Africa and Madagascar, areas which now account for over 95% of reported cases. The plague also has a detrimental effect on nonhuman mammals. In the United States, mammals such as the black-tailed prairie dog and the endangered black-footed ferret are under threat.